This was, like White Rapids, another suggestion from fishy as a book we could both read and then discuss. We've both been enjoying crime fiction, and I've particularly been enjoying classic crime fiction (see: Sayers, Conan Doyle) and so he encouraged me to try this out. Rex Stout was America's answer to the Golden Age Brits, writing a detective novel set on this side of the pond with a unique creature at its heart. It's not quite of the Chandler/Hammett hardboiled persuasion, nor is it cozy like a Christie. It's somewhere in between. One of Nero Wolfe's contract footmen comes by with a friend of his wife's. Maria's brother Carlos has gone missing, and she's worried something has happened to him, but the police are useless. Before long, it becomes clear that Carlos was a piece in a much bigger, more sinister, and more incredible puzzle. Archie Goodwin, our narrator and Nero Wolfe's right-hand (and both legs) man, sets off to bring the clues and his impressions to Wolfe, and Wolfe exercises his formidable intellect while remaining relatively stationary in his New York brownstone. This book wasn't what I was expecting, either the plot or the characters. I was thinking it would be something closer to the lines of a cozy, Golden Age British novel, with a detective who does what he does out of joy or out of a sense of what is right. Wolfe, however, is far more mercenary than I ever expected. I'm much more used to the altrusitic detective, who does what he does because he can't let the bad guys win. I was thinking that Wolfe is probably the most self-interested detective I've encountered, but it occurs to me that Holmes is pretty self-interested too, just in different ways. Wolfe does what he does for money (maybe a bit for fun, but mostly for money) and Holmes does what he does because it's a compulsion to solve puzzles. Holmes only takes the interesting cases, and Wolfe, it appears, would only bother taking the cases where there was a chunk of cash in it for him. This, among other things, makes it difficult to like Wolfe, but he certainly is interesting. Archie, on the other hand, is a little more familiar -- he works for Wolfe out of a passion for the work, I think, and out of a need to do right. He is our narrator, our Watson to Wolfe's Holmes, but he's also more than that. And I was quite enamoured with him. He's a little rough around the edges, and his descriptions and manner of speaking are more in line with something I would expect of Philip Marlowe. But he's got a big, surprisingly gentle heart, and his relationship with Wolfe is fascinating and rocky but with a deep affection at its core, and he's smart -- though, like Watson, his intelligence is deeply overshadowed by Wolfe's genius and he knows it. Also, unlike Watson, Archie isn't afraid to criticize the object of his admiration; far from it. I haven't met a character like Archie Goodwin before, and I really, really liked him. It's in Archie's characterization, his narration, that Stout's genius comes through. The writing is clever and full of vibrant life and great descriptions (thank you, Rex Stout, for reintroducing the word "corpulent" to my regular lexicon), but the author himself has disappeared; it's all Archie. There is a surfeit of telling here -- we are shown everything, from Wolfe's fascinating eccentricities to Archie's kindness and intelligence. The plot is a rather typical Golden Age-type plot, with a bizarre and incredible murder and melodramatic motive (and unfortunately, racist overtones that might have fit with the target readers at the time but jar with me now), but the narration elevates this book above many of its contemporaries, and it's easy for me to see why Stout's work is still in print. Due almost entirely to Archie, I could see reading the next in the series, despite the fact that Fer-de-Lance was a little bit out of my usual comfort zones. Unfortunately, fishy has informed me that brilliant writing that I so admired in this first book begins to fade as Stout finds his groove and his audience a few books in, and so perhaps I will avoid reading too much further, to preserve my contentment. I have never read this author, although I've always meant to. Sounds like I really need to give him a try! Darla, this book is great. I can't speak for the rest of the canon; apparently it's pretty uneven. But I really enjoyed this. 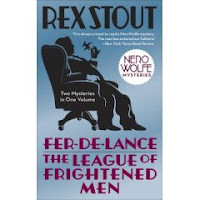 I love the Nero Wolfe books. Actually, I think they get *better* overall as the series goes on, though I admit, I have never, not even once, read them in order. There are things Stout doesn't bother to track, just as there are things Doyle didn't, but overall, it's a great series & I've read all the books more than once. The Archie-Wolfe relationship remains a delight. Hmm! Okay, so I will definitely have to try some of the later ones at some point and see what I think. Always good to have a second opinion!